A privacy fence could be an excellent addition to your landscape! As a homeowner there are many things you may find yourself encouraged to buy and do; some things can help your home and its value, others do not. Adding fencing to your home may not seem like a necessity, but it can add significant value to your home while offering a wide variety of benefits. Privacy fencing, in particular, provides a wide range of benefits to your home that we’ll discuss here today. If you choose to add a privacy fence to your home, you can expect a return on both actual and perceived value of your home. Many potential buyers see having a fence, especially a secure one like a privacy fence, to be a huge benefit. Not only do they see it as a means of increasing privacy, but it’s one less item they will have to worry about to protect children and pets. As the name suggests, adding a privacy fence helps you get just that. In neighborhoods with close together houses, this can help make your home feel more secluded and like an oasis rather than an observation point. Privacy fences keep the prying eyes of neighbors and passerby from getting a look at what’s going on in your home and yard. 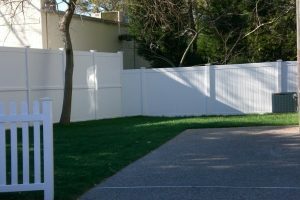 There are several layers of security that a good privacy fence can have. To start, they merely make accessing your home more difficult. Any potential criminals would need to climb the fence. Second, they make it harder for potential thieves from getting a look into your home to know if there are items worth stealing. Often this is a considerable hindrance to would be crime. Lastly, if you have pets or children, you can relax more knowing that they have no way of wandering out into a busy street. In many communities, it’s hard to tell where one property ends and another begins. Not only can this make navigating landscaping duties difficult, but it can make for some neighborly tension as well. When you hire a professional contractor, they can work with you to find the exact property lines of your home and then build your fence as a solution. This entry was posted on Friday, January 25th, 2019 at 10:32 am. Both comments and pings are currently closed.